Even when the weather appears fairly uninteresting during a settled spell, there's usually some things to look at - this plot (below) from midday on 8th January 2018 at Herstmonceux (East Sussex) of temperature with height, measured by instruments attached to a weather balloon, highlights some interesting features. 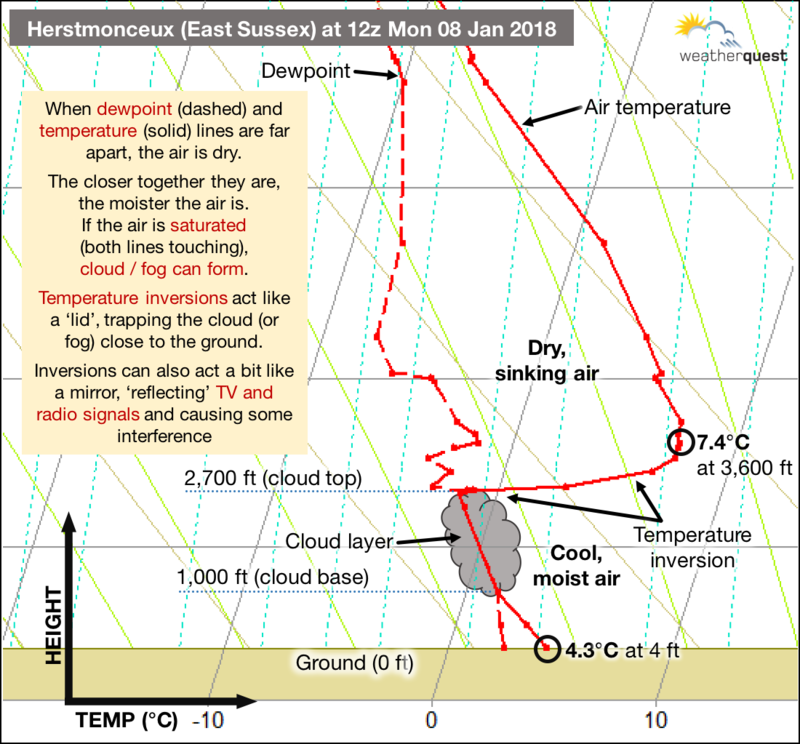 A temperature inversion is present, a result of dry air sinking through the upper/middle portions of the atmosphere courtesy of an area of high pressure to the east of the British Isles. But this dry, sinking air doesn't reach all the way down to the ground - instead, there is a shallow layer of cold, moist air trapped near the surface. Notice how the temperature at 0.7 miles (3,600 ft) above ground is actually warmer than that near ground level. The closer the temperature (solid) and dewpoint (dashed) lines are together, the moister the air is. 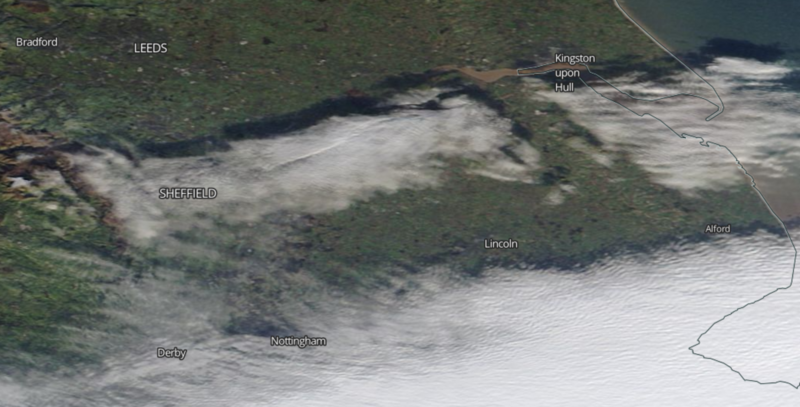 When the air becomes saturated (both lines touching), cloud or fog forms. in this example, a layer of cloud can be determined, its base around 1,000 ft (300 m) above ground. Any hills above 300m would likely experience 'hill fog'. 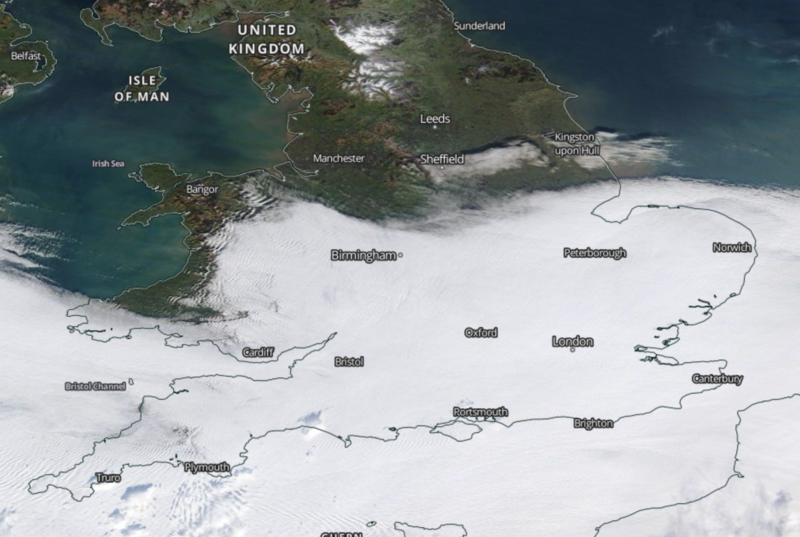 This layer of stratus cloud can be seen in the satellite image above, its progress northwards blocked somewhat by the higher ground of Wales which sticks out above the inversion. Most people's memories of the winter so far will be of cold weather conditions, trying to wrap up nice and cosy, or for those more into the snow, building snowmen and going sledging. However as we head into the Christmas period a more unsettled spell of weather bringing wetter and perhaps more importantly milder conditions will become established across the UK. So what is causing this change in weather pattern for the festive period? During the start of December a synoptic weather pattern became set up where an area of low pressure would be positioned over Scandinavia which is to the east of the UK, and higher pressure would be positioned over the eastern part of the north Atlantic, as you can see in the surface pressure chart below. Because the winds blow clockwise around areas of high pressure, and anti-clockwise around areas of low pressure, this resulted in the setup of screaming northerly winds coming straight from the Arctic impacting the United Kingdom. This resulted in below average temperatures with many areas only reaching daytime maximums of 1-2degs (if that). With these northerly winds came widespread snow showers, and on the 10th of December a warm front tried to encroach from the southwest into the cold air provided by the northerly winds bringing widespread heavy snowfall. 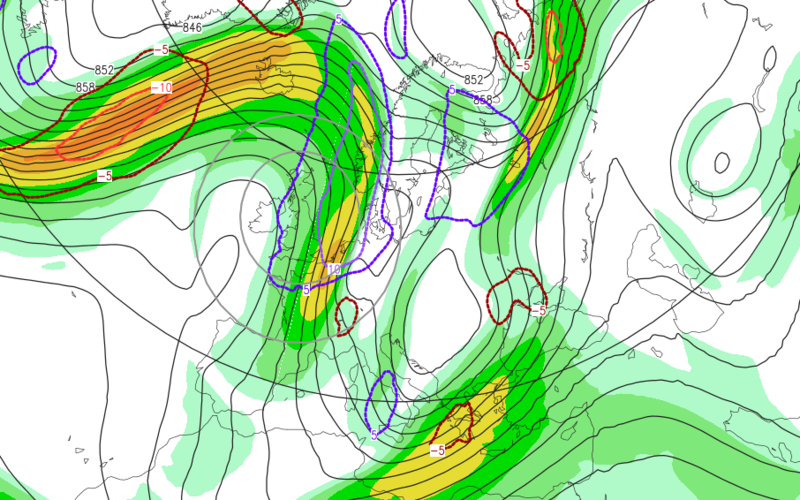 This synoptic set up was aided by the position of the Jet stream, which you can see in the image below. During early December the UK found itself positioned to the north of the Jet stream. Being north of the Jet stream meant the UK was on the cold side, enabling cold air to infiltrate from the north, into the United Kingdom. More recently however temperatures have started to rise, and the snow has pretty much melted away from southern England being contained to the hills and mountains of northern England and Scotland. Looking towards Christmas conditions look to become even milder still and more unsettled. The reason for this transition is that now the position of the Jet stream has changed, with the UK finding itself positioned to the south of the Jet stream. Being south of the Jet stream means the UK is "cut off" from the colder air positioned north of the Jet stream, resulting in milder conditions, as you can see in the chart below. As we approach the Christmas period, the Jet steam looks as though it will remain in a position where it prevents cold air reaching the UK to bring wide spread cold conditions and wintry precipitation. Looking at the festive period between Christmas and the New Year the Jet stream looks as though it will "straighten out" (compared to the image above )across the Atlantic and position itself over the UK, bringing wet and windy weather from various low pressure systems located in the Atlantic. Unfortunately this means a rather green Christmas this year, however if the UK finds itself in-between weather systems on Christmas day in the slightly cooler air, some snow showers over the higher ground of Scotland and Wales can�t be ruled out.